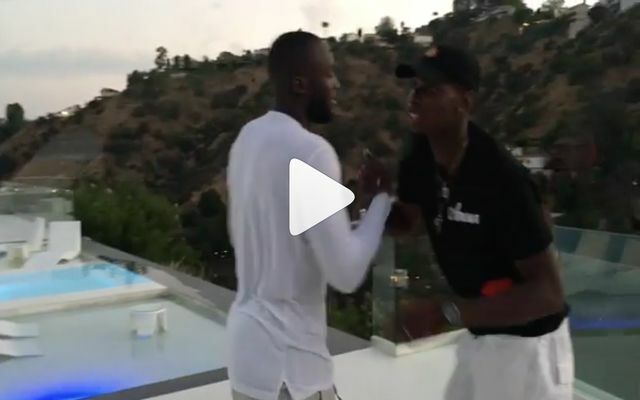 Man Utd ace Paul Pogba has welcomed his soon-to-be teammate Romelu Lukaku to the club, and judging by this video, he’s absolutely delighted about it. As seen in the tweet below, United confirmed the news that they had agreed upon a fee with Everton to sign Lukaku, although they have yet to officially unveil him as their player or release further details on his contract or the transfer fee. The Belgian international will now undergo a medical and agree on personal terms, but it looks as though Pogba has been doing his part to convince him to move to Old Trafford. While the pair have been on holiday in Los Angeles together over the past week or so, they’ve shared videos and images of them training at the UCLA campus to further fuel speculation that a move to Old Trafford was imminent. Now, the pair have seemingly wasted little time in celebrating the tweet from United, as seen in the video below, while Pogba added a caption stating that he would see Lukaku in training on Sunday, along with ‘#bienvenue’ and ‘#AgentP’, suggesting he’s been hard at work. The United squad is expected to arrive in California to start their pre-season tour tomorrow, and it looks as though they will have another marquee signing to welcome after Victor Lindelof arrived last month. Jose Mourinho needed to add goals to his team after Man Utd struggled last season with 54 goals in 38 league games, and with Zlatan Ibrahimovic moving on too, Lukaku is going to have a major role to play next season with much expected of his partnership with Pogba on the pitch too. See you tomorrow in training @rlukaku9 #bienvenue #AgentP? ?